They come at night. 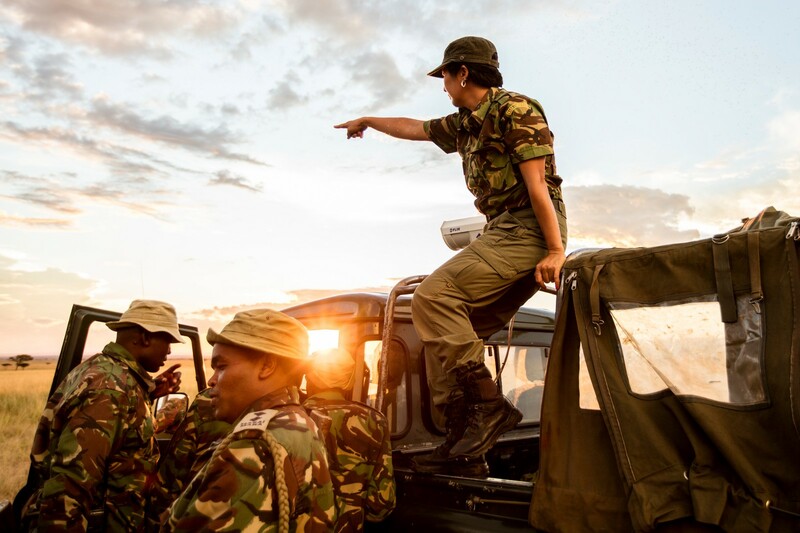 In the pitch-black darkness, poachers traverse the long Tanzanian border into Kenya and its protected parks and conservancies. They’re hoping to bring back lion, pangolin, or rhino and sell the valuable parts. 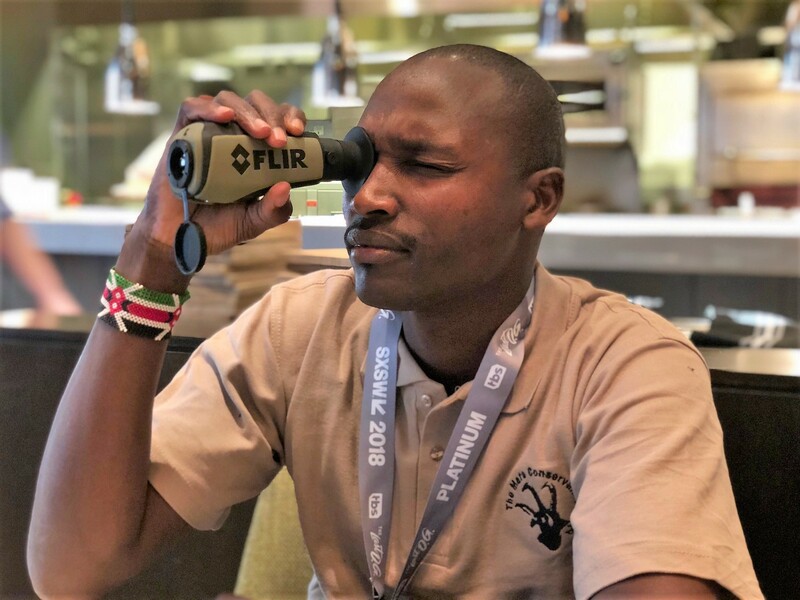 Langas, 30, is making his first visit to America, and his first to SXSW, to help publicize the plight of wildlife in his native Nairobi and the imaging technology he’s been using for the last two years to outsmart the poachers. Mara Conservancy Ranger Ntayia Lema Langas holding on of his FLIR portable thermal cameras. As he eats what looks to be his first yogurt parfait breakfast, Langas, who has a broad smile and, to keep warm, is wearing a jacket over his beige Mara Conservancy polo, explains that, until recently, the rangers would rely on intense patrols to catch poachers. Yet, in the continuous cat-and-mouse game, the poachers stopped using spotlights, making themselves almost invisible. The Mara Conservancy rangers were not the only ones who noticed the poachers creeping over the Tanzania/Kenya border. 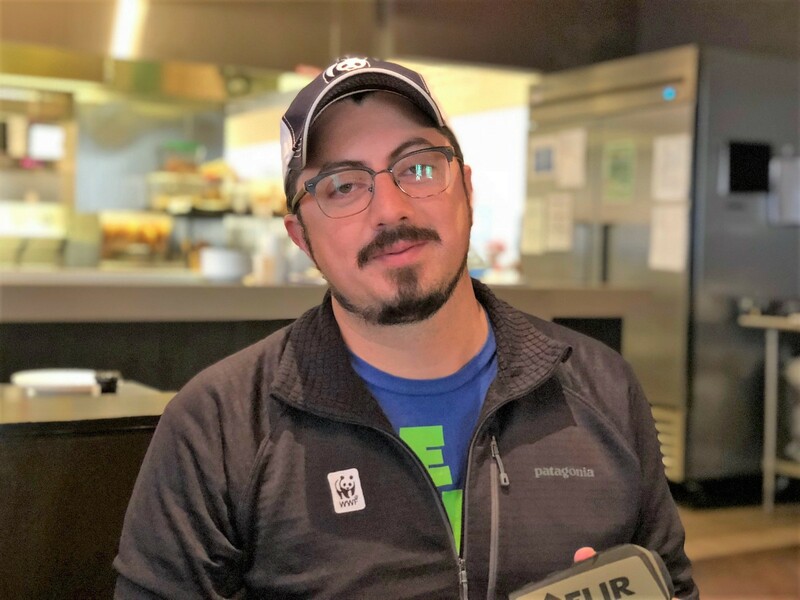 World Wildlife Fund Wildlife Technology Engineer Eric Becker, who’s sitting next to Langas, traveled to Kenya to address the problem first hand and convinced, among others, Google.org to help fund the tech that would stop the poachers in their tracks. “We want to give an asymmetric advantage to the rangers,” says WWF Senior Director Colby J. Loucks, who occasionally repeats Langas’s answers when I can’t quite interpret them through his thick Kenyan accent. In 2016, Becker began working with the FLIR to equip rangers with expensive, truck-mounted thermal cameras and considerably cheaper and more light-weight handheld units. The roughly $17,000 truck mounted ones (FLIR donated all the equipment) have been game changers. With them, Langas, who was the first ranger trained in the technology, can scan an area of up to 2 miles. For those unfamiliar with thermal imaging technology, it works in many ways just as it does in the movies (like Predator, but not completely). Instead of looking for light bouncing off an object, these thermal sensors measure infrared light coming off objects and use that to get a near instant heat signature. The camera shows those heat signature differences in a rudimentary but highly effective way: Dark is cold, Bright is warm or hot. Inert objects show up as dark. A tree is alive, but it has no heart or warm-blooded circulatory system, so it will show up as dark. 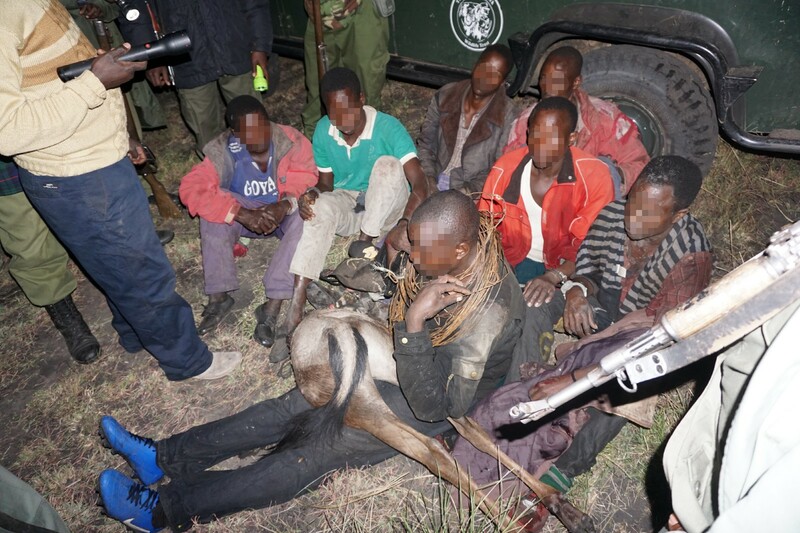 Animals running through the conservancy show up as bright objects and so do the poachers. Suddenly, poachers that could hide under cover of inky darkness are revealed. “These guys are deers in headlights. They have no idea they’re being watched,” smiles WWF’s Loucks. Real footage from inside the FLIR camera. The rangers use the powerful truck-mounted FLIR imagers in combination with their cheaper ($1,500) more short-range handheld units. None of these FLIR cameras are particularly high resolution, (640x480 for the truck camera and 320x240 for the handheld), but because they use such long wavelengths and large pixels, the resolution is hardly analogous to a standard digital camera. They hand me one of the portable FLIR units. I press it against my eye and scan the restaurant. The effect is like an old film negative. Across the table is Langas’s bright, glowing human shape. The camera is so sensitive that when another reporter places her hand on a wood panel behind us for a second and then removes it, the outline remains glowing on the panel for a few seconds after. Langas estimates that they’ve caught 100 poachers in the last two years and Loucks notes there was a poached Rhino late last year, but that’s because the wily poachers used a helicopter, which is not common practice. Turns out that action star Arnold Schwarzenegger’s famous mud camouflage solution in Predator was half-baked at best. His body heat would’ve change the temperature of the mud and, yes, the Predator and FLIR’s cameras would still have detected him. Langas, who has been struggling with the rapid temperature changes in Austin (60̊–90̊–60̊), marveled at everything in America, from snow to paved roads. His next stop is Colorado, where he’ll receive additional training. I tell him about the Rocky Mountains and he looks genuinely excited. But as I leave I realize that maybe I should have told him to pick up another jacket.